Caroline and Phil’s Mexico Destination Wedding in Riviera Maya, Mexico was one of the most fun weddings that we have ever documented. If you are planning a wedding, the images below will surely inspire you to consider a destination wedding! If you are just browsing, even just planning a getaway to Mexico in the dead of winter is a great idea! The grounds of Secrets Akumal were spectacular and there were endless photo opportunities. All of their friends and family were super fun and enjoyed laid back afternoons at the swim-up bar in the days leading up to their wedding. Their wedding day, on Cinco De Mayo, was an absolute blast. The groomsmen played volleyball that morning, while the bridesmaids sipped champagne while doing hair and make-up. 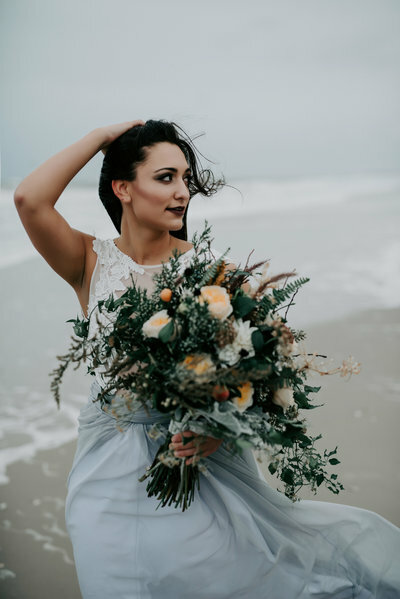 The seaside ceremony had the most beautiful tulips and bright flowers which popped against the gorgeous white sand beach. After a hilarious and emotional ceremony, champagne was passed out to all guests and they headed to a cocktail hour at sunset. Phil and Caroline made quite an entrance to their ceremony with a first dance that included fireworks! Gorgeous palm and floral decor rested on poolside tables and the guests enjoyed an amazing dinner. Afterwards, this crew took no time getting on the dance floor and stayed on the dance floor until the end of the night. If you are looking for a Mexico Destination Wedding Photographer, inquire about special pricing for destination weddings! Check out another one of our favorite destination weddings here.